The famous Pirates of Penzance make their entrance at Opera Theatre St. Louis. Playing it for all the silliness it deserves, Opera Theatre St. Louis brings us a highly polished production of “The Pirates of Penzance” to kick off their 38th season. A free-wheeling cast led by director and choreographer Sean Curran plays it for non-stop laughs and kept the opening night full house in stitches as one outlandish character and situation followed the next until the surprise finale with a very special appearance by a very special lady. We open in spectacular fashion as a 3-part ship soon comes together to make the infamous pirate ship that finds a happy Frederic who is spending his last day of indentured service as a pirate. His ward, Ruth, misheard his father years ago and thought he was to be apprenticed as a “pirate,” when, in fact, his father had said “pilot.” Now, with his twenty-first birthday, he is finally free from his duties and plans to find a suitable young maiden to marry since he’s not sure if the somewhat older and slightly portly Ruth is really representative of fine, feminine pulchritude. As they come into port, Frederic roams the sandy beaches until he hears the excited prattling of several young ladies. For the first time in his life, he realizes that Ruth has been lying to him about her virtues. The pirates soon join him and try to claim the young ladies as their brides. But enter their father, the Major General who will have nothing of it. Having heard of the tales of the rather gullible pirates of Penzance, he preys on their weakness for orphans and manages to save his daughters from the clutches of these unsuitable suitors. The nonsense continues with the arrival of the local constabulary who seem a bit reluctant to track down the pirate gang. But all ends happily for all involved once certain truths are revealed that bring everyone to the same frame of mind. All of this hilarity is accompanied by the brilliant music and clever lyrics of Gilbert & Sullivan. With patter songs, beautiful love ballads and outlandish chorus numbers, this is one of their best operettas. Bradley Smoak leads the way as the Pirate King. Patterned closely on the great Kevin Kline portrayal from many years ago, he swashes and buckles his way through every twist and turn of the silly plot while displaying a powerful bass that handles the humor in the lyrics perfectly. Matthew Plenk offers a bit of a contrast as Frederic with his sweet but naive outlook while his wonderful tenor soars- particularly on his duets with Mabel. As Mabel, Deanna Breiwick is lovely and talented. What else do you need in a heroine? Her lilting soprano brings down the house while her stunning beauty and way around the stage wins our heart. Maria Zifchak is the perfect comic foil as Ruth- also displaying a lovely mezzo-soprano voice. Hugh Russell delights as the Major General as he rattles off his nonsensical list of knowledge that makes him a “Modern Major General. And Jason Eck continues the silliness during his second act portrayal of the Sergeant of Police. He and his merry band of “Keystone Kops” keep us howling with the famous “Ta-Ran-Ta Ra” song and the goofy choreography that Sean Curran has them stumbling around to. As usual, the chorus is in excellent voice and bring their own brand of wacky bravado to the proceedings. And the St. Louis Symphony under the baton and “voice” of Ryan McAdams is superb. James Schuette has added a wonderful mix of costumes and a colorful and humorous set design, all lighted to perfection by Christopher Akerlind. This is one set of pirates you don’t mind keel-hauling your evening. With laughs and lots of “stuff and nonsense,” you’ll have a wonderful time spending two and a half hours with “The Pirates of Penzance.” Gilbert & Sullivan never sounded better and you can’t ask for a more inventive production. 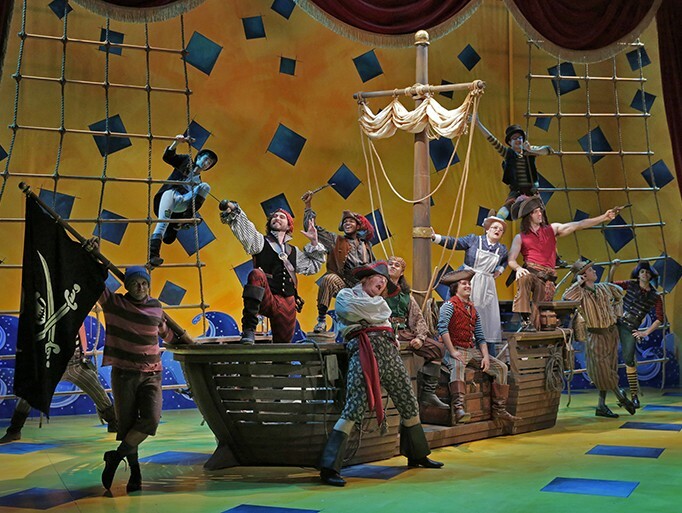 “The Pirates of Penzance” runs in repertory with three other operas through June 29th. Contact OTSL at 314-961-0644 for tickets or more information. This entry was posted on May 27, 2013 at 9:43 pm05 and is filed under Uncategorized. You can follow any responses to this entry through the RSS 2.0 feed. You can leave a response, or trackback from your own site.